The test quoted was a measurement of aiming error between different groups of shooters. Snipers and conventional competition shooters were represented. It was a measurement of aiming error as it applies to marksmanship. Not a measurement of fieldcraft, stalking, bravery, fitness, camouflage, who has the most MOLLE gear strapped to their kit, good looks, or anything else. The entire paper is available at the end of a Google search. SOCOM conducted the tests and Army Research Laboratory published the results. Please contact the folks putting the data out if the numbers aren’t to your liking. High Power and Long Range competitions are demanding conventional bullseye sports on a Known Distance course. It’s not combat. It’s not a dynamic sport. And it is more boring than golf to watch someone play. But it does measure basic marksmanship and riflery skills very well. The way I’ve always looked at this was that a bullseye KD course is like learning mathematics on paper, step by step, until you get to the point where you’ve memorized multiplitation tables and know the routes of solutions to algebra problems at first glance. After you’ve mastered the basics you can get out the calculator and use it for advanced math. Bypassing the KD bullseye course and going straight to the dynamic stuff on human-sized targets with all the technology is like the kid who relied upon the crutch of a calculator to do his basic math. That works up until you see him working the counter at McDonald’s. Give him a quarter from your pocket after he’s rung up your breakfast and watch him struggle. And because he doesn’t really understand math concepts he can’t tell where he made his mistake in complex math problems. When you make a bad shot in a KD course it’s a lot easier to reduce the variables down to identify where you made your mistake. When you do it in a complex shooting environment, you can tell yourself and everyone around you it was something besides you making a basic mistake. Was there any actual firing done in this paper? I could not find any evidence of such. >> Was there any actual firing done in this paper? I could not find any evidence of such. Page 9 shows Figure 5, with shot-to-shot error due to variable bias and random error. Page 11, Table 3 shows Round-to-Round Dispersion Errors. As to the specifics of what tests were conducted and how many rounds fired, you’ll have to contact the people that did these tests and published the results. I’m merely quoting their published paper. The team of SSGT Daniel Horner and SP4 Tyler Payne recently won the Open Class in the 2012 International Sniper Competition. Both of these men are competitive shooters in the Army Marksmanship Unit with emphasis on International Multigun and IPSC competition. That they are able to compete with and outscore operational snipers is telling. Page 9 is an a simulation of what all of these errors produce on a target. The table on page 8 lists the component errors they factored in and the weighting and direction of each (horizontal, vertical etc.) Note that below the page 9, fig 5 illustration is the statement. The use of the terms “Selected” and “Chosen” pretty much tells you that they had to pick values as opposed to measuring actual firing performance. Estimates for General-Purpose Rifles and Sniper Rifles of 7.62 x 5 1 mm and Larger Calibers” who again also uses the Error Budget approach, in this case judging from the title to estimate system error again. Note the use of the wording “Estimates” in the title. Sorry, I also agree in the value of competitive marksmanship, but this unfortunately is not evidence in support of that position. Page 19, 4.3 Error Budget Results. Note the use of the terms “derived” and “developed” instead of words such as “observed”, “measured”, “experienced” etc. Also note “total system error” is calculated through root sum square of component errors as opposed to simply measuring dispersion on a target. Here’s an example of downrange performance with shooters skill, conditions, system accuracy and bullet performance as inputs, and grouping on target as the output done by Brian Litz. This is sort of what Wahlde and Metz did except with more detail on the component errors. >> There was no live firing. The quoted portion of the test measured Approximate Aiming Error, a measurement of aiming error as determined by an ability to obtain and maintain sight alignment and hold on specific point on a target. The paper is basing this on tests conducted by others and using their results as a part of this analysis. Even without a live fire component, such tests could be done with Noptel, SCATT and similar devices. I just pulled LTC Weaver’s article and am reading through it now. I’ll let you know what it says. Keep in mind the Weavers paper was published in 1990 which may prdate the Noptel, RIKA, and SCATT etc. Table 4 in Von Wahlde and Metz’s paper was originally labelled Table 2.19 in the source research by Weaver. Hopefully this clear up that those numbers were the author’s (Weaver’s) estimates and were not the product of side by side testing. In the complete Table, there is also verbage that tell you the numbers were estimates such as “Not Estimated” for the Williamsport shooter >300 Magnum. And in the note below the table it talks about the component errors that they omitted from the estimates. Here’s the table clipped from the article with those sections highlighted. So I felt I was giving the shooter the benefit of the doubt using an estimate for aiming error under benign conditions for a hypothetical operational mission. The gentleman shot a 10-round group at 1000 yards of less than 3″. 2.815″ to be exact. This calculates to 0.08 mils so obviously his aiming error was less than 0.1 mils. It is a remarkable group as I would think the round-to-round dispersion would be greater than that. (See Figure A-1, pg. 46) But, as the article points out he took extraordinary measures to minimize round variability. 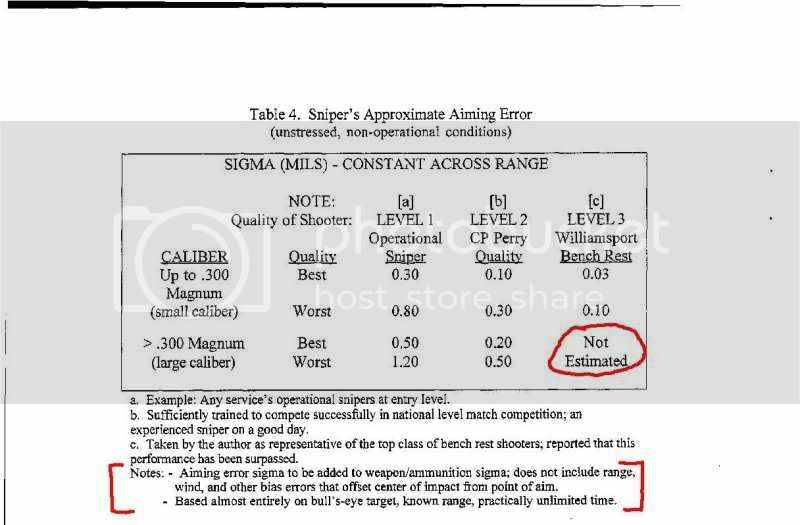 The table under discussion in this thread (Table 4 in my report, Table 2.19 in Weaver’s) estimates the aiming error for a a Williamsport bench-rest rifle to be 0.03 mils. That seems like a reasonable estimate of the above referenced shooter’s aiming skill. So it gives me some confidence that 0.1 mils for a non-bench-rest gun is not too far off. As I point out in my report, 0.1 mils corresponds to approximately an 8″ circle at 1000 meters. In other words a head shot that any sniper would be proud to achieve. In hindsight, I agree with Mr. Buol’s suggestion that “a measurement of aiming error as determined by an ability to obtain and maintain sight alignment and hold on a specific point on a target” would have been a better means of quantifying the aiming error. Outstanding! Thanks for the info. Very interesting study. Fortunately, Sniping is more than just trigger pulling on a known distance, stationary target under a fixed time limit that is made known long in advance. Fundamentals are always important no matter what kind of shooting you might be doing. But a little context may be relevant in this case. That x% difference between a Sniper’s wobble and a Competitive Shooter’s wobble may be the difference between hitting that insurgent who is about to fire that RPG. When a competitor misses they might lose a match which means that will have wasted hours of practice and probably hundreds of dollars in training expenses. When a Sniper misses in combat it can mean someone’s life. A Marine Scout Sniper once estimated that every successful kill he scored equates to saving an average of 13 of his fellow Marines’ lives. It’s a matter of perspective. Everything in your comment explains why snipers should try to be as skillful competition shooters. The known-in-advance advantage found in some (not all) competitive events applies equally to everyone participating. The course of fire description and rulebook are the mission brief and OPORD. The score is a numerical measure of the participant’s ability to prepare and perform. Lower results such as found in this quoted test is due to lesser skills as that was the only variable at play. So annoying that low-level shooters continue to whine about this obvious fact. A solid competitive long-range shooter may fire 1000-2500 rds per year, in competition where every individual shot can mean the loss of the match or an aggregate. The pressure is high on each and every shot. Some do this for 10-30 years, making multiple shoot-offs for all of the marbles in state, national and international competitions. How many high pressure shots does the sniper make in their entire career and how much practice do they get between their high pressure shots? Pressure and ultra-precision are the same in both disciplines. But when one learns to control pressure 500X more often and for a longer period of time, who can you count on to deliver a picture perfect shot under intense pressure? You’ll get no argument from me! Thanks for adding this.